The E nebula or Barnard 142 nebula, an area of ​​cosmic dust that avoids light from the stars behind it is located in the constellation of the Eagle. About 2,000 light years from here, this nebula can be distinguished with binoculars with the naked eye on clear nights. Unfortunately, the best time to see it is in summer since now in winter, the elliptical is practically on the horizon. 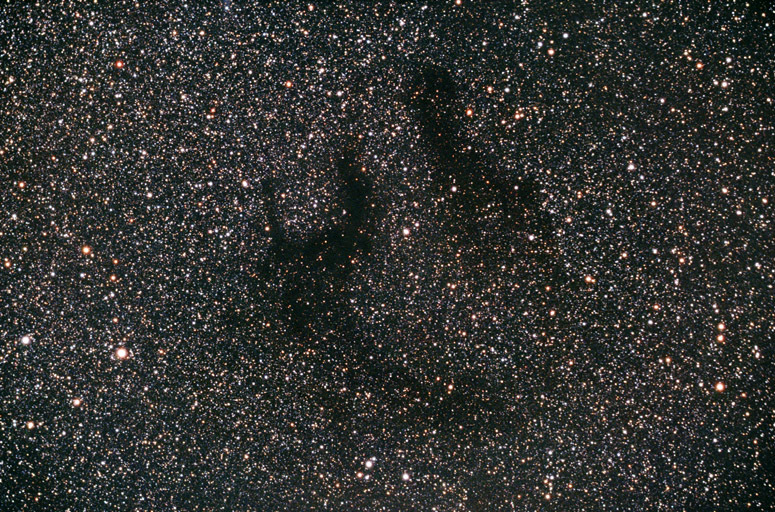 As I said, this is what is called the dark nebula, where dust clouds are so dense that they absorb all light. Normally this type of nebulae, its composition, is what is called molecular gas at low temperatures. What is molecular gas? Because simply molecules that absorb very large wavelengths (light, we go) such as formaldehydes, cyclopropylenes, heavy compounds of carbon and oxygen, ammonia. Heavy molecules, come on. Obviously, under other wavelengths, such as infrared, you can see “through” them. The important thing is that they are basic for the formation of stars and planets thanks to their density and the materials that compose them. That is, they are nurseries of new stars. The nature of the universe (which is nature alike) is recycled.